who were successful in their UTME this year. written by JAMB candidates just after the UTME before admission. Post UTMEs are just recognized admission screening exams that higher institutions in Nigeria conduct for students who apply for higher education admission in Nigeria. 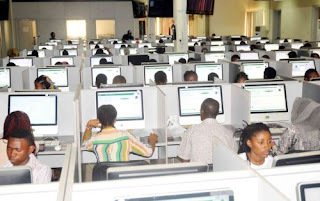 Each university organizes and conducts her own Post UTME but for a candidate to take part in this exam, the candidate must have applied to the university, wrote JAMB exam with a score equal to or above the general JAMB and university cut-off mark . If a candidate fails to write Post UTME, he or she will be denied admission irrespective of how high the candidate scored in JAMB exam. WHO CONDUCTS A POST UTME? HOW MUCH DOES POST UTME REGISTRATION AND APPLICATION COST? Currently JAMB has passed the law across all institutions that the amount for the Post UTME should not exceed #2000 .Any institution reported of collecting above this will surely be banned. Just like the Post UTME cost, there is no single way to register for Post UTME. Each university plans their own registration process and majority of the institutions have an online Post UTME registration portal. You should keep the following information in mind when applying for Post UTME in any institution in Nigeria. Many Post-UTME admission screening forms will require some or all of this information. format: JPEG [i.e. ‘.jpg’] ). The Post UTME pattern is almost similar in many institutions. It is also similar to JAMB questions. If you have studied well for your JAMB exam, writing Post UTME will not be difficult. have registered for in your JAMB and its subject combination. subjects including English Language and depends on your UTME subject combination. It is advisable to go through past exam questions for an exam you are writing for the first time. Before we let you know where you can get or download Post UTME questions for your chosen subjects, you can take a simple look at this post UTME question sample below. HOW DO I GET POST UTME PAST QUESTIONS? about where you go looking for Past Questions—you don’t want to get defrauded. together. For instance, if you will take 4 papers in your Post UTME it might be hard to find the 4 papers bundle together in a free download. They usually scattered in different single subjects. If you have N1,000 to spare, we have a Post UTME CBT software for Windows laptops, PCs or desktop computers and phones. We also have the Post UTME CBT app on Google Play Store for Android phone users. Benin, University of Calabar, University of Lagos, University of Ilorin, University of Port-Harcourt, University of Uyo, Nnamdi Azikiwe University, University of Nigeria and additional 4000 questions. WHEN IS THE POST UTME DATE? from June – July and can last to November for most institutions. To stay updated on Post UTME news, keep checking our Post News page or our Admission News page . HOW DO I CALCULATE MY POST UTME SCORE? There is no simple or general formula in use when calculating Post UTME score. Some institutions do not make their calculation open. Perhaps, the reason is because there are many considerations and factors that influence how Post UTME score is calculated. institution is the sum of your UTME SCORE divided by 8 and your POST UTME SCORE divided by 2.
you write your Post UTME and you will see a simple form where you will enter you exam numbers and pin code. Submit the form by clicking on the submit button. Your result will be display on the page. To stay updated on Post UTME news and stay informed whenever schools release their Post UTME forms, keep checking our Post News page or our Admission News page . IS POST UTME COMPUTER BASED TEST or PAPER BASED EXAM? WILL MY SECOND CHOICE UNIVERSITY CONSIDER ME FOR POST UTME? huge number of candidates that applied to the institutions and the many numbers that scored above JAMB cut-off mark. There are other institutions that allow second choice candidates to take part in their Post UTME. Basically it depends on each institution since they do not have a single law that guides them when it comes to internal decisions in an institution. CAN I WRITE POST UTME FOR A UNIVERSITY I DID NOT APPLIED FOR? UTME. It is usually some universities that have programmes with little students on their list.But also beware of scam. IF I SCORE LESS THAN MY COURSE CUT-OFF MARK IN POST UTME, DO I STILL HAVE HOPE? It will be very difficult for any candidate to get admission in any institution whose cut off mark, he or she failed to meet. It will be advisable to change your institution or course!! Share to help others !! You can also leave a comment as all questions will be attended to within one hour! !